Siblings arguing is a constant battle we face everyday in our house! 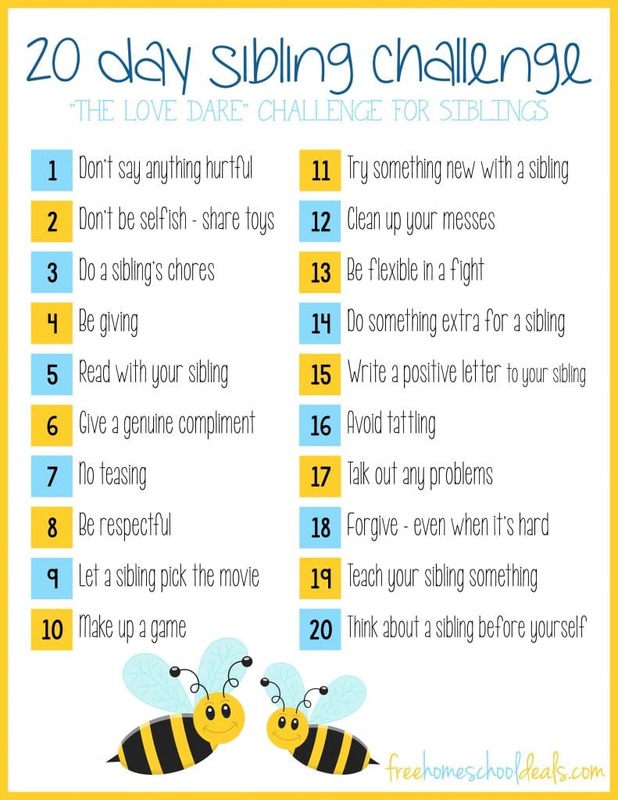 Inspired by The Love Dare for married couples, here is a free printable 20 Day Sibling Challenge; a twenty day challenge for sibling harmony. Samantha is a teenage homeschooler from Indiana, USA. Samantha is interested in WWII history, Israel, and politics. Her specialities are words, frugality, homeschooling, and procrastination. When not blogging, Samantha spends her time reading, exploring Photoshop, trying to speak Hebrew, and wasting time on Pinterest. You can also find her on Facebook and Twitter. I don’t agree with the tattling one – I want my kids to tattle! That way I know what’s going on! If you teach kids not to tattle about little stuff, they’re less likely to tell you the big things too! Yeah, I personally think the term “tattling” can be misused. I don’t use that word at our house (not that we’re perfect or have it all figured out, haha). Early on my kids would try to tell me something and a family member would say “don’t tattle on so-and-so” etc. That didn’t sit right with me and I had to work through my feelings on it. The way I explain it to my kids now is #1 they can ALWAYS tell momma and daddy *anything. * #2 It’s fine to tell me what someone else is doing, but don’t say “brother is doing this-and-that” just to get him in trouble. If he’s doing something that’s not safe and/or that needs to be known, please let momma know ASAP. But the heart of it is not *just to see him get in trouble. * Clear as mud? Samatha, the sweet homeschool teen who made this printable, did a great job. She’s very creative!